Published on September 19, 2007 in Faith. 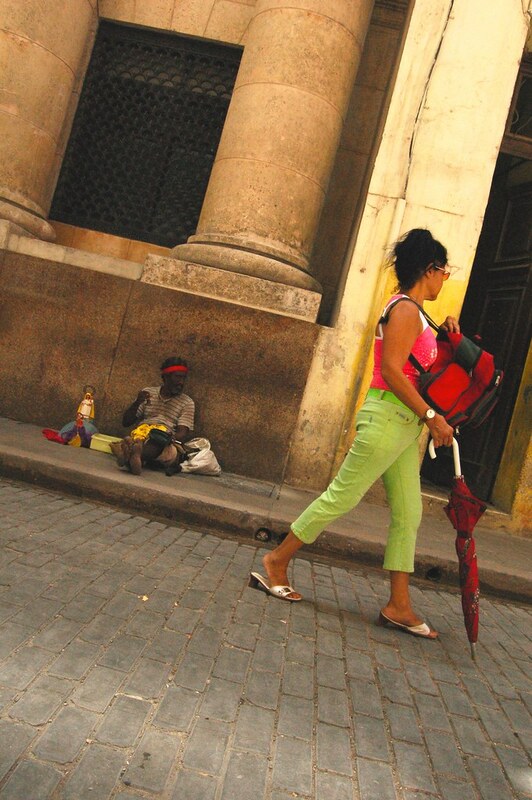 Closed Tags: cuba, global, havana, inequality, poverty, unrelated photo. 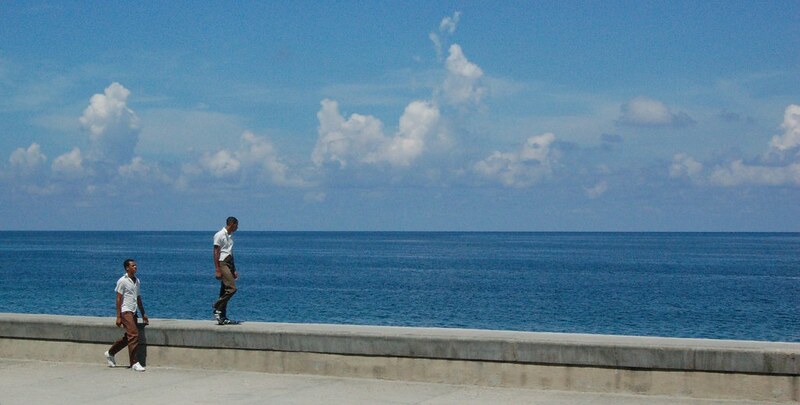 Two Strangers on the Malecon by Isaac Holeman. My Mom once told me about a short story written by a couple that had been budget traveling around Cuba and had some minor fiasco on the street. I think one of of their bag’s broke and some important papers flew into the wind and onto the street. A nice Cuban couple helped them pick up their things, struck up a friendly conversation, and eventually invited them to come to their home for dinner a few days later. After a wonderful dinner and some very interesting conversation, the Cuban couple asked if they traveling couple might help pay for the dinner, Cubans don’t have much money they said. This seemed reasonable, except that the price the Cubans were asking was significantly more than a reasonable restaurant would have charged for the fare. This seemed a little bizarre and unfair to the travelers, but they felt indebted for the hospitality they had received, and it was clear that despite their tight traveling budget, they certainly had more worldly goods to call their own than this Cuban family. They paid what the Cubans asked for the food. Later, after more witty and exotic conversation, the Cubans began repeatedly mentioning things that other foreigner friends had gifted to them. A stereo from a Canadian family, a TV from England, a load of school supplies for their darling child. Before long it was clear that this traveling couple was also being asked to give great gifts. There was never any real fear involved, not a thought of danger. Just guilt, how foul is that? These Cubans were just being really friendly and then rubbing it in that respective social/economic systems leave people with drastically different access to commodities, often with place of birth being the greatest distinguishing characteristic of the individuals involved. How rude of them to ask for all kinds of things they don’t need, just because they were charismatic enough to very quickly become friends with people who do have those things. Or, how right, perhaps. How is it that people like me develop such a great sense of ownership that we feel indignant when others ask that we, of our own will and expense, put them on an equal playground. I say people like me because I speak from experience, sort of, maybe. The other night coming home from dinner, one of our friends was waylaid by the classically Cuban conversation starter “wha cantri you fram?” Their child was breathtakingly cute, dancing wildly to the regatton blasting in the distance. The couple were so engaging, we talked politics, religion, and music there on the street while the ladies from our group danced, chased, and hugged their little girl. They also talked about foreigner friends, and ended up showing us the shirt and backpack their Canadian friends had bought for their daughter. I got a bad vibe early and remembered the story above, but my friends were enamored. Before we left they had invited us all for dinner and dancing in their home, told us to bring as many people as we could. They would call to remind us and then would pick us up at the hotel, even though they lived so far away they would need to take hours of bus rides to get to our hotel. When they called to remind us, my friend sensed something very creepy and as of about half an hour ago, we decided not to go have dinner with them. I was sort of expecting to get scammed, but the word scam really doesn’t describe the sick twistyness of it. I still wanted to go, even if to repeat the heinously awkward circumstances of the other traveling couple. Anyhow, I admit relief at not having to risk saying no, or yes, to friends. ps For those of you who aren’t very familiar with Cuban culture, this set of experiences is no more representative of all Cubans than thieves, pranksters, and neoliberals are representative of all US residents. Published on September 15, 2007 in News. Closed Tags: cancun, cuba, global, havana. The Color in Habana Vieja by Isaac Holeman. As some of you may know, I now write from Havana, Cuba. Smiley face X !!! to the power of * is how much I like it here, so far. Yes, I know that’s an impressive number. I’m on the honeymoon with this country. On the way from the US I stopped for one night in Cancun because standard airlines may not fly directly from the US to Cuba (don’t forget the economic/political blockade our tax dollars have built up around Cuba). I met the other twenty six students and my professor at the hotel and various airports along the way. This group of people is great and I am overjoyed to be here with them. Cancun itself is horrid. It boasts a reeking blend of the frivolity of Vegas (in it’s reputation, I’ve never actually been to Vegas), the numbing commerciality of WallMart, and a truly impressive concentration of embarrassingly drunk and ostentatious tourists from the US. An advertisement for Señor Frogs, a popular club/disco, summed it up will with the slogan where nobody knows your name. Cuba is rather different. To begin with, shops and restaurants put up signs, but there are no further advertisements (a particular shock after Cancun). Instead, the streets of this country are marked by mural sized quotations of famous activists, leaders, and poets. 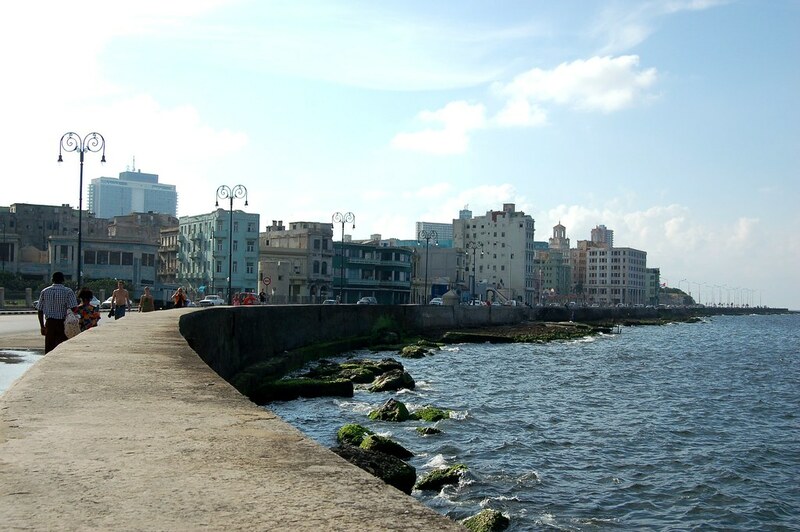 The Old City, Habana Vieja, recalls a very humid, crumbly, grandiose city in Eastern Europe. I makes me wonder what parts of Budapest might look if it’s most noble neighborhoods were also its most decrepit. You might click on the picture to see the rest of an album from la Habana. Today I discovered that the Lonely Planet Guide to Cuba features the same bearded man wearing a starred hat that I photographed in the picture with a lady in a pink dress. Havana already begins to feel like home. I just came back to its familiar places after a ten day tour of the southern and eastern parts of Cuba, but more on that later.